Hi, all! I hope you had a wonderful weekend! I was traveling most of the day yesterday so that I was able to see some of my favorite girlfriends from college as one of them is about to welcome their first baby into the world. I spent over five hours listening to Rachel Hollis’ podcast and feel like I just came off of a motivational weekend, haha! She’s such a powerhouse of a woman but at the same time, she continues to remind us that all she did was keep going and never accepted a ‘no’ that came her way because her (our) dreams are more important than that. I know I’ve talked about her book Girl Wash Your Face before, but if you have yet to read it, I highly recommend. I also had time to make an outlet pit-stop, which is never a bad thing! It’s always fun finding a few great finds at crazy marked down prices. I now have some Easter clothing and upcoming birthday presents already tucked away! All in all, it was a much appreciated day to myself. I wore this outfit yesterday which felt like a good ‘middle of the road’ outfit to both travel, shop and attend a baby shower (she’s having a boy, by the way). I’ve had this sweater for a while now, but there are a bunch of similar options that I’ll share below. 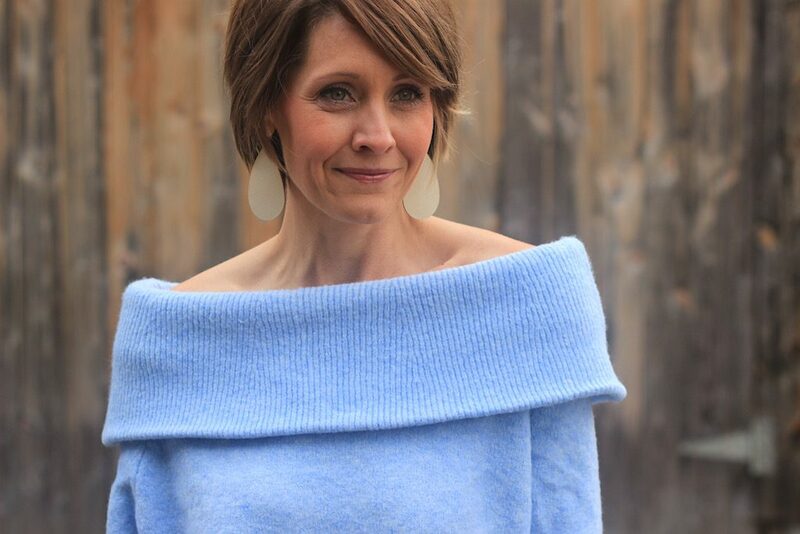 I love off-the shoulder sweaters because they are just as warm and cozy as a typical sweater, but lend toward the dressy side allowing you wear them for more festive occasions. And in case you were wondering, it was actually no problem to shift the sweater to wear more like a cowl-neck so that I could layer my coat over top.